Anjali Monteiro is a Professor at the School of Media and Cultural Studies, Tata Institute of Social Sciences, Mumbai. She has a Bachelor’s degree in Psychology, a Masters degree in Economics and a Ph.D. in Sociology. She is involved in documentary production, media teaching and research. She teaches courses in documentary and video production as well as theoretical approaches to image making practices and has done pioneering and innovative work in critical media education with various groups including activists, school and college students, parents and teachers. Jointly with Prof. K.P. Jayasankar, she has won thirty-two national and international awards at documentary film festivals. A presiding thematic of much of their work has been a problematising of notions of self and the other, of normality and deviance, of the local and the global, through the exploration of diverse narratives and rituals. These range from the stories and paintings of indigenous peoples to the poetry of prison inmates. Their most recent award is the Basil Wright Prize for So Heddan So Hoddan (Like Here Like There) at the 13th RAI International Festival of Ethnographic Film 2013. Retrospectives of their work include Vibgyor Film Festival, Kerala, 2006; Bangalore Film Society, 2010; Madurai International Film Festival, 2012 and Parramasala Sydney, 2013. An adaptation of their film Saacha (The Loom) was a part of the art exhibition Project Space: Word. Sound. Power. at the Tate Modern, London, in 2013; and at Khoj, New Delhi in 2014. They have served as jury members and as festival consultants to several film festivals in India. They have mentored many award-winning student and fellowship documentary film projects as commissioning editors. 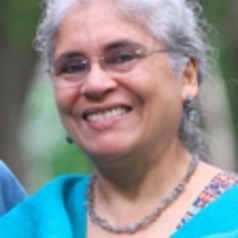 Her doctoral work involved an ethnographic study of television audience reception in a working class neighbourhood in Goa, in the late 1980s. She currently writes in the broad area of media and cultural studies, with focus on documentary film, censorship, critical theory and issues of media representation. She has been a visiting professor at several Universities, including University of Technology Sydney, University of Western Sydney, Lund University, Sweden and University of California, Berkeley. She has a book entitled A Fly in the Curry: Independent Documentary Film in India (Sage, 2016), co-authored with Prof. K.P. Jayasankar. She is active in campaigns against censorship and for freedom of expression.